LONDON, Ky. – After being raised on a farm riding horses, Amy Henson dreamed of owning a horse farm when she grew up. To make her dream a reality, she knew she had to make some money. So Amy set out to become an eye doctor. She graduated from the University of the Cumberlands in Williamsburg, Kentucky, with a major in biology and a minor in chemistry, then got her doctorate in optometry from Indiana University. Amy Henson and her husband, Wes McFadden, bought Rock Bottom Stables in Laurel County eight years ago. Among their 20 horses was a mare that couldn’t produce any milk for her foal. Their veterinarian suggested feeding the foal with goat’s milk, so two Nubian dairy goats were added to the farm. Soon, the goats were producing more milk than the foal needed. Amy’s mind flashed back to an organic chemistry lab from her college days. She thought since she made it through that class, she should be able to make soap. So Amy became a student of soap-making, studying books and websites. “She’s self-taught,” her mother, Phyllis Henson, said proudly. 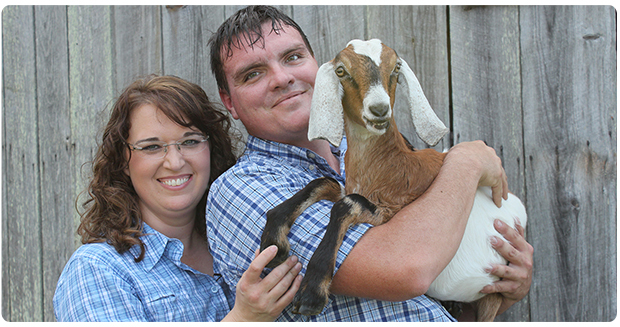 Three years after starting their Appalachia Proud soap business in her home, Amy and Wes have a herd of 30 goats that produced enough milk for Amy to fill her first big retail order – 2,400 bars of handmade soap. That, along with 2,400 jars of homemade body butter, will be displayed in Kentucky Proud kiosks located in 88 Kroger stores across Kentucky, which Agriculture Commissioner James Comer announced Nov. 6-7. In October, the coffee-guzzling doctor stayed up nearly all night, while also working full-time during the day, to complete the Kroger order that filled a 12-foot box trailer. “For three weeks, I was up ’til 2 or 3 [a.m.] at night, then got up and went to work the next morning.” Amy said, calling the business arrangement between Kentucky Proud and Kroger an “amazing” opportunity. The farm is now called Rock Bottom Stables and Soap Co. They chose the name of the farm as a double meaning. Selling to friends, family, and a few small retail shops around Kentucky, including Completely Kentucky in Frankfort, Amy’s fledgling soap business quickly outgrew the Hensons’ home. Amy’s soap business relocated to a former John Deere mower repair garage at 429 E. Fourth St. in London, which was operated by her father, Red Henson, who died 10 years ago. To make her soap, Amy thaws frozen goat milk in a slow cooker, then mixes it with lye and three oils – coconut, olive, and castor – along with a fragrance or pigment. Her body butter is made from shea butter, avocado and sweet almond oils, distilled water, plant-based steric acid, emulsifying wax, and a paraben-free preservative to inhibit mold growth. “We try to keep our products as chemical-free as possible,” Amy said. Rock Bottom also makes other products like lotion bars, body polish, bath fizzles, sugar cube scrubs, and lip balm. Rock Bottom’s best-selling soap is oatmeal and honey, which will be displayed in the Kroger kiosk along with seashore and black raspberry vanilla scents. According to a Rock Bottom brochure, goat’s milk soap moisturizes dry, irritated skin. In fact, one of Amy’s first customers was her husband, who owns a landscaping business. “While working, I had to wrap my hands in a towel because my knuckles got so dry they would crack and bleed,” Wes said, showing his knuckles that now show no signs of dryness since he starting using the soap. One of the things that sets Rock Bottom soap apart from commercial brands, according to the company brochure, is glycerin, which helps the skin retain moisture but is removed by commercial soap makers. A molecule found only in goat’s milk, capric-capryllic triglyceride, has been found to be very healthy for skin, Rock Bottom and other goat’s milk soap makers say. Amy said she still gets a thrill out of making one of her batches of handmade soap, which takes five to six hours to solidify, then up to four weeks to dry out completely. For more information about Rock Bottom soap, go to www.rockbottomsoap.com.